AS / NZS 1580.408.5 – Paints and related materials – Methods of test Adhesion – Pull-off test. 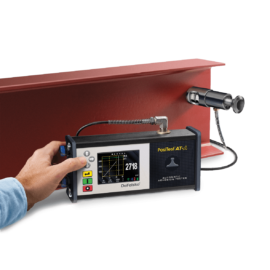 This test method provides a laboratory or field procedure for quantifying the adhesion of a coating by determining the greatest perpendicular force (in tension) that a given surface area of coating can bear before it is detached. The test method can be used for all coatings on rigid materials but is particularly suitable for testing adhesion of coatings on concrete and masonry surfaces.